Importance. -- These weevils attack both red and white oaks and are found wherever the hosts grow. Also, weevils in the genus Conotrachelus and moths in the genus Melissopus account for some losses. A major portion of the crop may be destroyed. Identifying the Insect (figure 42a). -- Acorn weevils are robust and brown. The beak is long and slender, sometimes longer than the body, in the female. The larvae are legless, robust, dirty white, and C-shaped. Identifying the Injury (figure 42b). -- There may be one or more holes in the acorn. Dissecting the acorn will reveal signs of feeding and one or more C-shaped larvae. Biology. 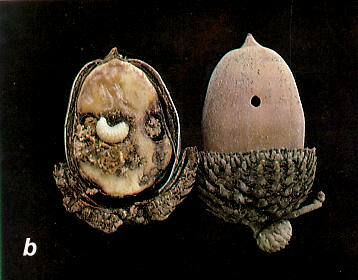 -- Female weevils drill one or more holes into the acorn and deposit a single egg in each hole. Larvae feed until full grown, then cut exit holes in the shell. Full-grown larvae enter the soil where they spend 1 to 2 years before pupating and emerging as adults. Control. -- Natural controls help to minimize losses. Chemical control may be needed in seed orchards. Figure 42. 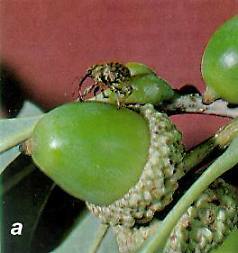 -- (a) Adult acorn weevil on acorn; (b) larva, feeding injury, and exit hole of acorn weevil.